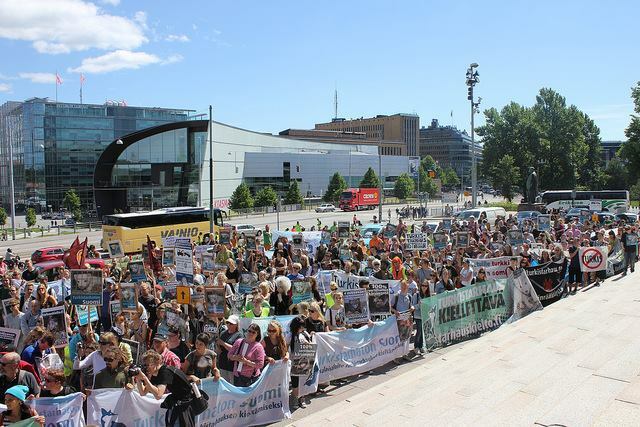 Finnish and Estonian animal protection organizations are organizing a massive international demonstration this Thursday, May 21st, for banning fur farming in Finland. Among others, the event is supported by the world’s largest animal protection organization PETA (People for the Ethical Treatment of Animals). “We are participating in the demonstration, because the Nordic animal rights activists are working towards the same goal. With our joint forces, we are hoping to ban fur farms in the entire region,” noted Kadri Taperson, the manager of the NGO animal advocacy organization Loomus. “There is a particularly important reason for cooperating with the Finnish organizations: the owners of the largest fur farm in Estonia come from Finland,” explained Taperson. The international petition for banning fur farms in Finland, which collected more than 200 000 signatures, will be handed over to the Finnish parliament during the demonstration in Helsinki, at which thousands of people are expected to participate. In addition to PETA, other international organizations, such as the Chinese organization ActAsia, Brussels lobbying organization Eurogroup for Animals, international anti-fur alliance Fur Free Alliance and Swedish animal protection organization Djurens Rätt, are supporting the demonstration. From the Estonian side, the demonstration is organized by the NGO animal advocacy organization Loomus and the animal rights organization In The Name Of Animals (Loomade Nimel); and from the Finnish side, Animalia, Animal Eco, Luonto-Litito, Maan ystävät, Oikeutta eläimille, Sey Suomen Eläinsuojeluyhdistysten liitto, Vasemmistonuoret, Vegaaniliitto and Vihreiden Nuorten, and Opiskelijoiden Liitto. “Finnish fur farms are an international mark of shame. I am glad that the Finnish fur farming problems have reached the international arena and that PETA supports our pursuits for banning fur farms in Finland,” said Salla Tuomivaara, the lead of the Finnish animal rights organization Animalia. PETA was founded in 1980 and the organization has more than three million members. Many celebrities, such as Joaquin Phoenix, Paul McCartney, Bryan Adams, Ricky Gervais, Alec Baldwin, Pamela Anderson, Iggy Pop and Brigitte Bardot belong to the supporters of the organization. Gathering at the Senate Square on 21.5 at 15.30. The parade will start moving at 16 and reach Kansalaistori Square, where the representatives of the Parliament will receive the petition for banning fur farms in Finland, at 17. Several local and international performers, including Kadri Taperson, the manager of the NGO Loomus, will also give speeches there. The NGO animal advocacy organization Loomus aims to protect the rights and interests of animals, and represent their interests in social discussions. Primarily, Loomus stands for the animals used in agriculture, animal testing, entertainment and fur farming.